American physicist and inventor Robert Goddard was the first person to invent and create the world’s first liquid fuel rocket. Born in Massachusetts in 1859, Goddard was interested in engineering and technology from an early age. Encouraged by his father, Goddard conducted experiments in his own house which sometimes even led to explosions. He loved the outdoors and was skilled at using a rifle. He read H.G. Wells book “The War of the Worlds” at the age of 16 and his interest in space travel was fixed. On October 19, 1899 he climbed up a cherry tree to observe the sky and later recalled this incident as being monumental in fueling his imagination for space travel. For the rest of his life he commemorated this day as “Anniversary Day” in remembrance of his childhood dream. Goddard was a frail child suffering from various ailments. His health forced him to be left behind in school, at which point he became an avid reader at the public library. His interest in aerodynamics led him to study the Smithsonian journal as well as Newton’s Principia Mathematica. When he returned to school, he excelled at his schoolwork and was twice elected class president. In 1904 he enrolled at the Worcester Polytechnic Institute and became a lab assistant and tutor for Professor A. William Duff. After receiving his degree in physics in 1908 and serving as a physics instructor for three years, Goddard enrolled as a graduate student at Clark University. He received his M.A. in 1910 and Ph.D. in 1911, both in the field of physics and went on to become a research fellow at Princeton University. In 1926, Robert Goddard constructed and successfully tested his first rocket using liquid fuel. His rocket took its first historical flight on March 16, 1926. His work did not receive much support from the government initially and he had to further his research on modest financing received from the Smithsonian Institution and the Daniel Guggenheim Foundation. He was granted a leave of absence by the Worcester Polytechnic Institute of Clark University to conduct his research in the field of rocketry. He continued to research using his own funds and submitted a proposal about a rocket flight to the moon which was received with skepticism by the press. He received a total of $10,000 from the Smithsonian and documented his progress in a paper titled “Liquid Propellant Rocket Development” which was published by the Smithsonian in 1936. His talent in creative science and practical engineering was largely unrecognized for the major part of his life but his contributions were undeniably monumental. Some of his major contributions include developing rockets that could reach high altitudes such as to the moon, developing and launching a liquid rocket fuel, shooting a scientific payload in a rocket flight, using “vanes” in rocket motor blasts and developing pumps suitable for rocket fuels. His notable patents include one for a vacuum tube, obtained in 1915, and one for a multi stage rocket, obtained in 1914. In all, he held 214 patents. He was seriously ill with tuberculosis which hampered the progress of his work. He was greatly skeptical of the media as they often ridiculed his efforts as being impractical including an article in the New York Times titled “A Severe Strain on Credulity“. 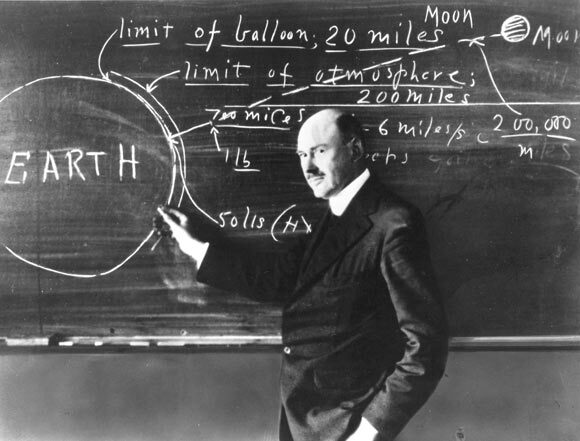 Robert Goddard died in 1945 and has since received widespread credit and awards for his work, including a 131 patents awarded after his death.